NGS: Next Generation Solutions, Inc.
Suspenders, an advanced software product from Next Generation Solutions, Inc., makes it easier than ever before to keep track of assignments and tasks (suspense items) throughout an organization. No matter how large your organization, or how many assignments flow through it on a monthly basis, Suspenders provides a sure way to stay on top and ensure that critical deadlines are met. Suspenders provides on-line tracking of time sensitive assignments at all organizational levels, and ensures that management is aware of the status of delegated tasks at all times, through the provision of numerous management reports and graphic displays. This system also provides documentation of employee performance in meeting schedules and deadlines. Automatic assignment of internal control numbers to each suspense item and assignment. Easy, documented delegation of assignments to staff members. Generation of cover sheets for each copy of the suspense item assigned to staff. Ability to attach electronic documents, graphs and charts to suspenses. Facility to completely document actions on the suspense with instructions and comments. Automatic e-mail of key events, questions, actions and comments to the project staff working on an assignment or project team. Visual, color-coded graphic representations of your pending items, so you can determine priorities at a glance. Complete text and Boolean searches of your entire suspense database. A variety of informative reports and screen data views. 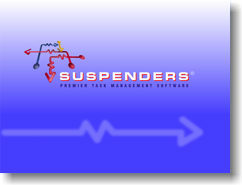 Suspenders is sold on both a per-seat and concurrent user basis. Please contact us for current pricing. © 2003 Next Generation Solutions, Inc.